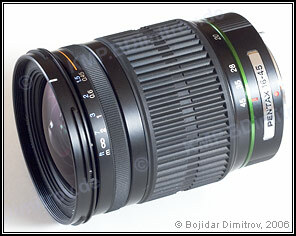 This is the first Pentax lens specifially designed for the smaller image circle of the Pentax digital SLRs. It features the new “Quick-Shift-Focus-System” which allows manual focus-corrections in AF mode. Informal user tests indicate that the lens is very sharp and contrasty, with flare and distortion also being very well controlled. There are, however, high levels of cromatic aperation at 16 mm, but they can be easily “cured” in the appropriate post-processing software.